b) should you continue to drive for a touchdown, and hope to get a quick field goal later? It seems like a question we could answer with empirical win probability, but there cases of relevant situations leave the intent of the offenses unclear. Teams overwhelmingly prefer option b. The answer is dependent on a number of important factors, including score, time, field position, and timeouts. We would need a large sample size for each combination of factors to build a reliable model for when (if ever) it would be a good idea to try an immediate field goal. It’s definitely a question outside the box of convention, and a perfect problem for my simulation model, the WOPR. The WOPR can create as large a sample as desired for each combination of relevant factors. We can then compare the win rates for the two alternative strategies—immediate field goal attempt, or continue to drive for the touchdown. Judging by recent examples, the conventional strategy is to forgo the immediate field goal attempt and continue to drive. I’ll call this the standard strategy. In my formulation of the standard strategy in the simulator, I programmed the offense to continue its drive as it otherwise would and try a field goal any time it reaches 4th down. For the FG first strategy, I programmed the offense to attempt an immediate field goal and then proceed as it otherwise would according to general onside kick guidelines other end-game tactics. The number of timeouts for the team on defense (the team ahead) would be a very minor factor and would come into play only in the most freakish sequence of events. For these sim runs, I left the defense's timeouts at 3. Together the initial parameters comprise 960 various scenarios, so I’ll present the results for only a handful of representative examples. But it should be enough to convey the general pattern and gain some insight. The first example situation is down by 10 points, 1st down & 10 at the 30 yard line, 2 timeouts. 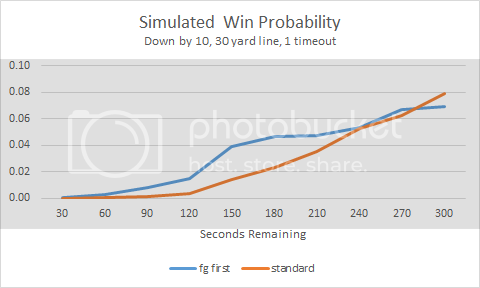 In this scenario, the preferred option is to continue the TD drive until about 4 minutes remaining, when the FG first strategy becomes the preferred option. By the 3-minute mark, the advantage for attempting an immediate FG becomes quite pronounced—5.5% to 3.5%. Now let’s change one parameter. The next example moves things to the 15-yard line, keeping everything else the same. The FG first strategy loses much of its advantage as we get closer to the end zone, which makes intuitive sense. It becomes preferred much later--inside 3 minutes to play--and by a slighter degree. Next we’ll go back to the 30-yard line and take away a timeout. 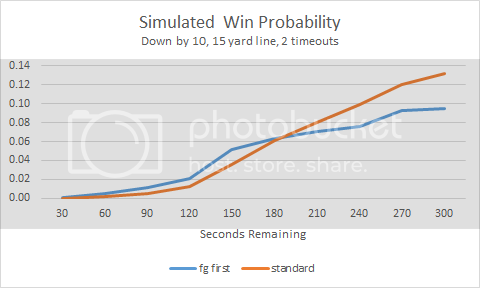 Win probabilities for both strategies suffer due to the fewer number of timeouts, but the standard strategy suffers slightly more. The advantage for the FG first strategy is more pronounced, at least in relative terms. The last example changes the deficit to 9 points. The FG first strategy is preferred as early as almost 5 minutes to play. These results surprised me. Going in, I thought there would likely be very few scenarios when a FG first strategy would be preferred. I thought something was wrong with the model, so I watched the simulated play-by-play for several games. When a team was able to tie or win, they were able to do one thing almost every time. They avoided a situation that called for an onside kick. That’s what’s driving these results. Onside kicks require the pathway to victory to pass through a narrow probability corridor. Successful recoveries are especially unlikely when the receiving team is expecting them. Continuing a drive intending to get a touchdown, even if successful, forces a team into a situation when they have little choice but to kick onside. The bottom line is to do whatever is needed to avoid needing an onside kick. Notice how the 15-yard scenarios don't indicate as much of an advantage for taking the field goal first. That's because the amount of time an offense seeking a touchdown could burn from the 15 isn't as much as much it could burn from the 30. The probability for the need of an onside kick diminishes the closer an offense is to the end zone, given the same time remaining in the game. The second most important factor is the need for a stop. Assuming an onside isn't required, a team down by two scores will need to make a stop between scoring. Kicking an immediate field goal allows for the possibility that the opponent is able to get a first down or possibly more before the trailing defense is able to get the ball back. That's why the advantage for the field goal first strategy begins as early as five minutes left to play. I wonder if the best thing to do might be to take three quick shots into the end zone with a low-risk mindset prior to attempting a field goal. If the play isn't there, the quarterback should be quick to throw the ball away. That strategy burns only a handful of seconds off the clock but gives the offense a realistic chance of getting a quick TD and then only needing a field goal to survive. As with most strategic questions, the difference might seem minor. One option might offer a 6% chance of winning and the other a 3% chance. But as I always say, every little bit helps. A team could get an extra couple percent here, another few percent there, and pretty soon you can build a 10% edge each game. The next step is to create something useful for coaches. Coaches shouldn't care whether one tactic would result in a 0.05 WP and another would result in a 0.03 WP. They just need to know which one is better, and when. The actual WP numbers themselves aren't critical. So a table or set of tables that lists the time at which the field goal first alternative becomes preferred, based on score, field position, and timeouts, might be handy.